You must race through a series of tough cycling races. Each race you win will unlock new races. New bikes can be purchased with prize money in order to be faster! GAMEPLAY You can ride faster by simply tapping the screen. When you stop tapping energy will slowly restore. It is important to always use other cyclists to block the wind in order to not waste energy. Energy is restored slowly, but if you let your energy drop too much you will be in trouble. 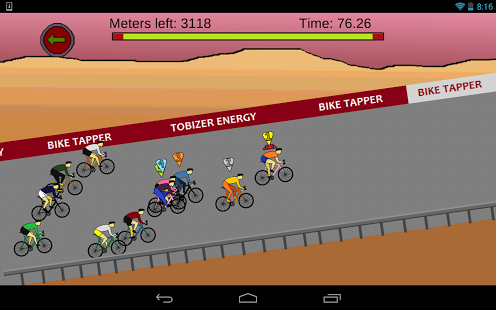 Make sure you have enough energy to finish the bicycle race. BIKES There are 27 different bikes of several different colors which can be purchased with prize money. Each bike has its specialty such as Uphill, Sprinting, and Downhill. Usually the more expensive the bike is the faster it will be. 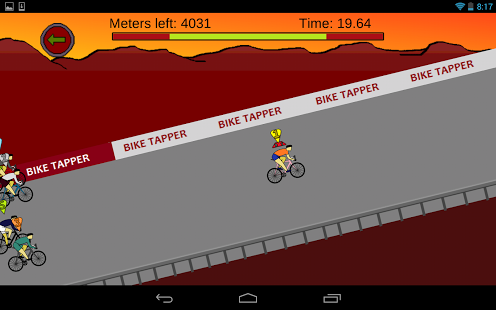 However, computer cyclists will bike faster and faster as you pass each level. Be sure to find a good balance. You need an Uphill bike for races that are uphill and Downhill bikes for races that are downhill. Be sure to choose the best bike for each race and don't forget to save up for better bikes. LEVELS There are 42 levels each increasing in difficulty. Every time a race is won prize money is given. Each level has unique terrain and scenery. Some levels are mostly downhill and other allow for uphill and even sprinting. 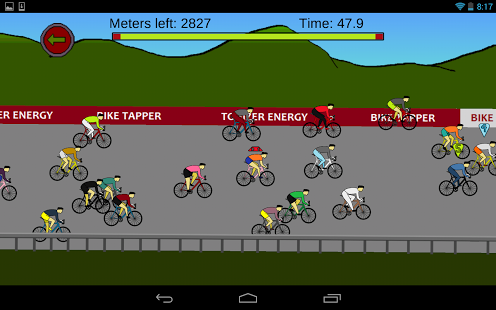 In every case Bike Tapper will require you to tap away to conquer such tough competitions.